That whirring you hear when you boot your computer or when it wakes from sleep mode is the sound of your hard drive’s magnetic disks beginning to spin. Conceptually not dissimilar to a record player, a hard disk drive (HDD) is an electromechanical device with an actuator arm that positions itself over spinning disks, called platters, in order to read or write information. While record players top out at 78 rpm, today’s enterprise-grade HDDs can spin at 15,000 rpm. Even at that speed, however, there are unavoidable delays associated with heads finding the spot on the drive that contains the data being requested. And sometimes a drive may need to read from multiple locations in order to complete a command, multiplying wait times. Solid state drives (SSDs), as the name suggests, don’t have moving parts or spinning disks. They use interconnected pools of flash memory that are managed by an SSD controller to deliver speeds far beyond what an HDD can offer. Some rough examples: SSDs can reduce boot time from around 35 seconds to about 10 seconds. Write speeds for an HDD might be in the range of 50-120Mbit/sec. compared to between 200-500Mbit/sec. for an SSD. An HDD might be able to complete between 50-200 input/output operations per second, while a comparable SDD might be able to do as many as 90,000. And some enterprise grade, rack scale SSDs claim to be able to process millions of operations per second. But despite their performance advantages, SSDs only have a 10% market share compared to HDDs for a couple of reasons. First and foremost, they’re expensive. HDDs today average around 3-4 cents per GB, compared to 25-30 cents for SSDs. For example, a 1TB internal HDD costs around US$40, while a comparable SSD costs around $250. The second reason is that SSDs are quirky little devices that get slower as they fill up. And eventually, the flash cells reach a state where they can no longer complete write operations at all. SSD makers have created clever workarounds, including something called garbage collection, in order to mitigate this problem, and SSD vendors will tell you that today’s devices have reliability and longevity equal to HDDs. But the perception lingers. Overall, the trendline for SSDs is certainly pointing up. 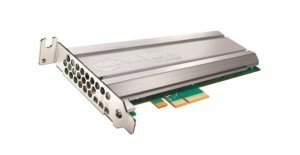 On the consumer front, manufacturers are starting to make SSDs standard equipment on their higher end desktops and laptops. And that speed advantage is making SSDs desirable in cloud and enterprise scenarios where performance is paramount. Gartner is predicting that by 2021, 50% of data centers will use solid state arrays for high performance computing and big data workloads, up from less than 10% today. A simple USB flash drive (or thumb drive) is an example of solid-state drive technology. An SSD is a larger, more complex device that aggregates pools of NAND flash storage, the type of storage also found in MP3 players and digital cameras. Unlike RAM, which doesn’t retain data when the machine shuts off, SSD flash memory is non-volatile, which means data is retained whether the device is powered on or not. With SSDs, every block of data is accessible at the same speed as every other block, no matter the location. This makes SSDs inherently faster than hard drives, where platters are spinning and drive heads are moving to the right location. With HDDs, large files can be broken up and tucked into unused nooks and crannies of the drive, and data can be easily updated in place. This allows for efficient use of the total drive capacity. On the other hand, scattered data obviously takes longer to locate, which is why defragmenting a hard drive has become a standard part of device maintenance. SDDs have a different and bigger problem – SSDs can only write to empty blocks. That’s okay when the SSD is new and all the blocks are empty. But over time, as blocks get filled up, overwriting data becomes an issue, because the only way an SSD can update an existing page is to copy the contents of the entire block into memory, erase the block and then write the contents of the old block in addition to the new data. If there are no empty blocks available, the SSD must scan for blocks marked for deletion, but not yet deleted, erase them, and then write the data to the now-erased page. Over time, as the SSD fills up, writing to the drive becomes more complicated and slower. SSDs use a combination of methods to overcome this problem, including overprovisioning; wear leveling, a type of load balancing for flash cells; and garbage collection, a process that works in the background to delete stale files and optimize the available space, similar to the defrag function in HDDs. SSDs have a number of advantages over HDDs that can help offset the difference in sticker price. SSDs are quiet. They don’t vibrate, which improves reliability. If dropped, a hard drive might get damaged; not so with an SSD. They use less power and generate less heat, which can add up to big savings in a large data center scenario. They are also smaller and more powerful than HDDs, so data centers can pack more storage into less space. And, of course, there’s the speed advantage. Since HDDs have a massive installed base of customers who basically feel that disk drives are “good enough,” the decision to go with a new and different technology requires that companies build a solid business case. Companies need to conduct a detailed cost/benefit analysis to determine whether a move to SSDs make sense. One deployment approach would be a slow migration where SSDs would be a requirement in new servers and storage devices. Another approach is to use SSDs exclusively for “Tier 0” data in a tiered data storage scenario. Tier 0 data is transactional data requiring high performance, such as in financial or ecommerce applications. Other enterprise use cases for SSDs include ruggedized notebooks or laptops, applications where boot time is important, the editing of large media files like video and audio, cache drives and database servers. At the same time that enterprises are thinking about SSDs vs. HDDs, it’s important to note that the total volume of data is exploding, so most companies will continue to buy both types of drives for a very long time. In fact, IDC predicts that even as SSD sales volumes increase, solid-state drives will still only amount to 20% of total market share in the enterprise by 2025.